If you weren’t already aware, October 1st-7th is National Walk Your Dog Week. While I’m not entirely sure precisely why such a mundane activity merits a national observance, I feel it would be irresponsible of me not to advise any humans who might be interested in taking part. ‘Do I need to walk my dog?’ you may be asking yourself. The answer is, of course, yes and for many reasons. The first reason is that your dog definitely needs to get outside to work off excess energy. Excess energy that might otherwise be used to annoy, irritate and otherwise bother any cats that you might share your home with. Without proper exercise, your dog might also resort to destructive behaviors such as chewing and barking. A walk allows bonding time for you and your pet. Allow your dog to walk without a lot of chatter. Dogs, in my humble opinion, are simple creatures and perform best when you limit verbal discourse to commands, so allow them to just be with you while you walk together. They don’t mind the quiet as long as you are together and you allow them to sniff to their heart’s content. A bit of exploring is a very important thing for a dog and humans often don’t understand how exciting it is to sniff every plant, rock and leaf that you might come into contact with. Believe me, though, it’s important to your dog. Let’s face it – one of the most important reasons to walk your dog is for fitness! I personally feel that I get enough exercise strolling around the clinic to make sure everything is operating according to plan, but this is not enough exercise for dogs or humans. Get out there and walk, bike or run. If you’re walking long distances, it may be a good idea to bring water for you and your pet and if you’re running or biking, good footwear is a must. 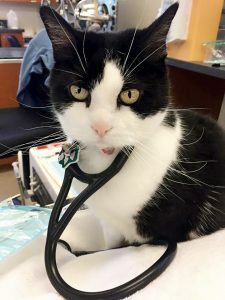 Again, not necessary for cats as we prefer a bay window and some of those really awesome catnip mice we keep at the clinic, but remember – dogs are much more prone to set lofty fitness goals and never seem to plan ahead. In conclusion, take some time this week to stop and smell the fire hydrants, get your fitness together and stay hydrated while being careful of tender paw pads. Your dog will thank you, your fitbit will probably congratulate you and, perhaps most importantly, your cat will appreciate the blessed solitude.